I spent a lovely evening down at my local school yesterday. As part of a community initiative we had a series of workshops given by local parents – it was my turn last night. I decided to do my workshop on lavender, my most favourite plant and the pride and joy of my garden (and by garden I am referring to the overgrown wilderness that currently exists around my house). Why do I like lavender so much? Apart from the beautiful colour, delicate flower and amazing aroma I like it because there are so many things you can DO with it!I admit I only tend to be drawn to plants that have a function or use to me! That is probably why I like my herbs so much (they appeal to the green witch within). Lavender fulfills the criteria for functional plant in more ways that I can count! Culinary, cosmetic, medicinal and ornamental… it has it all. I thought I would share some of the recipes and uses I have come across for lavender and look into a little bit of the science behind the plant. Lavender (Lavandula) is a genus comprising almost 40 different species of plant. It belongs to the mint family, Lamiaceae. The name Lavender comes from the Latin word lavare meaning to wash, a reference to the fondness of the Romans for use of the herb in their baths. The plant appears often in historical reference, being used in ancient Egypt as part of the embalming process. 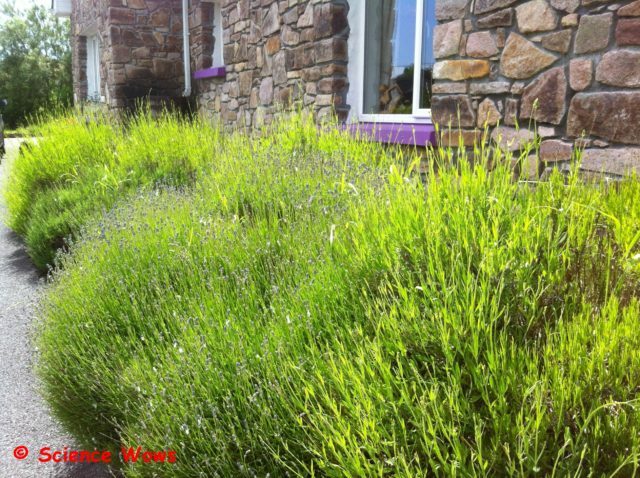 The lavender plant is a shrub like plant that is native to the Mediterranean and many parts of Africa and Asia. The size of the plant varies between species but is typically between 30 to 90 cm. The common colour of the flowers are the classic “lavender” colour but the range can vary from white to pink to blues to purples. The plant is grown commercially to harvest it’s flowers. It is the small hairs or spikes on the plant, located between the petals and the stem that produce the oil that give the lavender its lovely scent. This oil is distilled to produce lavender essential oil. Lavender essential oil is used in perfumes, cosmetics, clinical applications and aromatherapy. Different plants are favoured for different scents or different active components. The most common essential oil is extracted from Common or English lavender (Lavandula angustifolia) but other species such as lavender stoechas (Lavandula stoechas), spike lavender (Lavandula latifolia) and lavandin (Lavandula x intermedia)are also used. Although each different lavender essential oil shares a common chemical composition they differ in the dominant chemicals found in each and thereby differ in their clinical applications. Lavender has been used for years as a calming agent and a means to reduce stress and anxiety and enhance restfull sleep. As well as using essential oils for these remedies, the dried flowers, tincture and teas may also be used. Studies have shown that lavender does have a mild sedative effect and both men and women exposed to lavender essential oils at night time showed an increase in deep or slow wave sleep (SWS) resulting in more enegry the following morning. 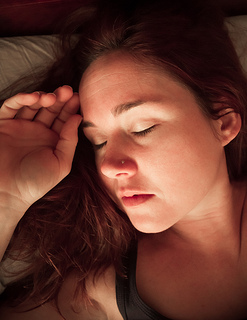 They also showed an increase in light sleep (stage 2) and a decrease in Rapid Eye Movement (REM) sleep. Lavender aromatherapy treatment has also been shown to result in a measurable decrease in stress levels, and is associated with a decrease in anxiety and stress related headaches. Lavender oil was commonly used in hospitals in recent history because of its associated antibacterial properties. It was also used in the treatment of cuts, wounds and burns. There are plenty of studies confirming the antibacterial properties of lavender, particularly lavender essential oils. Lavender oils have also shown a significant effect on decreasing the growth of a number of fungi associated with common skin and nail infections. It has also possible applications in the treatment of sinusitis. The antifungal and antibacterial properties of lavender have made it useful in the treatment of skin conditions such as eczema and acne. Studies confirming the anti inflammatory nature of lavender reinforce its associate with healing allergies, rhinitis, rheumatoid arthritis, asthma, burns and general swellings. Some people have reported an adverse effect when using products containing lavender, most notably skin reaction and irritation when lavender essential oil is rubbed directly into the skin. Exposure to lavender in strong concentrations has also been linked in some people to side-effects including headaches, nausea and irritability. A study published in 2007 suggested a strong link between prepubertal gynecomastia (benign male breast development) and the use of products containing lavender and tea tree oils. It is usually recommended that pregnant and breast feeding women avoid the use of lavender oil due to a lack of evidence supporting it’s safety at these stages. Lavender is used in a variety of cosmetics such as soaps, bath products, cleansers, toners, hair products, moisturisers and creams. It is added to these products for a variety of reasons… for its scent, antiseptic and antibiotic properties, to relax and soothe and to ease swelling and inflammatory pain. The ideal time to harvest your lavender is when the flowers have their true colour and are just beginning to open. Cut at least 10 to 15 cm below the flower. Gather the cut lavender together in small bunches and secure with an elastic band or equivalent. Hang the bunches upside down in a dry, well aired space (away from direct sunlight) for two to three weeks, until the flowers are completely dry. Once the flowers are dry they may be used in a variety of ways. If you want to remove the dried flowers from the stem hold thestem over a large bowl and gently rub the flowers with your fingers and the flowers should fall off easily. This is a great activity to do while watching tv or chatting as it is time consuming to harvest the flowers from a large bunch of dired lavender (but a very pleasant task). and store in a dry place. When you are ready to use your bath bomb just pop it into your bath and watch it fizz away releasing the little lavender flowers and the lovely scent of lavender. The fizzing is due to the reaction between the citric acid (acid) and the bread soda (base/alkaline) once water is added, producing bubbles of carbon dioxide gas. To make your own lavender oil fill a clean, dry, seal able container with dried lavender flowers and then cover with sunflower oil (or another vegetable oil). Seal the container and place in a dry place for at least two weeks, shaking once or twice a day. The length of tine you leave it determines the strength of the smell of lavender in the resulting oil.After two weeks strain the oil through muslin or a fine sieve into a clean dry container or bottle and seal. This oil can be applied directly to the skin or added to bath water. Apart from the medicinal, cosmetic and ornamental applications of lavender, it is also great as a flavour in our foods. 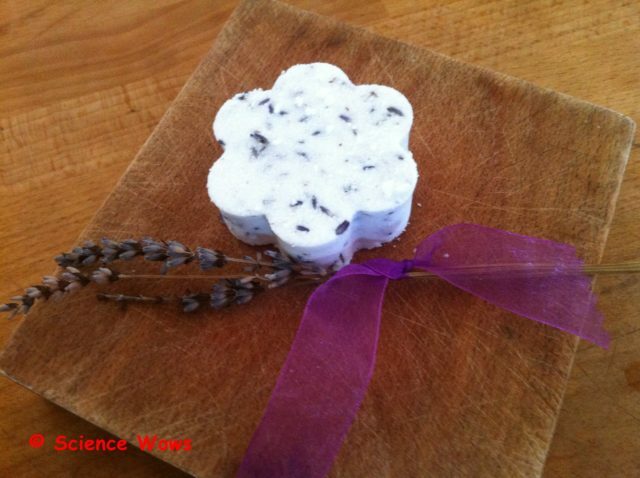 The flowers are often added to sugar to give it that delicate lavender taste. 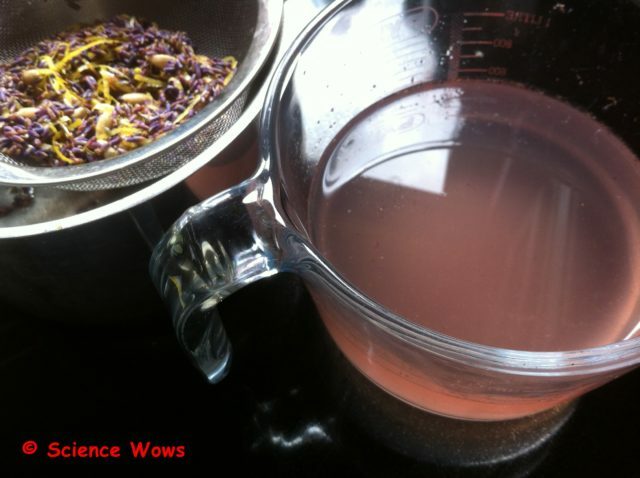 The preference in our house when it comes to combining lavender and sugar is to make lavender syrup…. Place the lavender and water into a saucepan and place on a medium, heat to a simmer and leave for five minutes. Add the sugar and stir continuously until all the sugar has dissolved. Remove from the heat and allow to cool then transfer to a suitable container, cover and refrigerate for two to three days. Strain through a fine sieve or muslin into a sterilized container, seal and store in the fridge for up to three weeks. It never lasts more than a few days in our house though as the kids just love it poured over a warm fresh batch of drop scones. 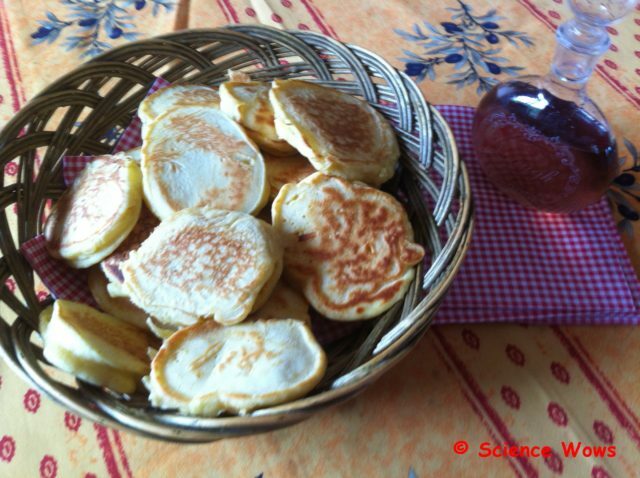 On the subject of refreshments I thought I would share two recipes… one for the children and one for the adults.Lavender syrup can be used much like honey or maple syrup, as well as on pancakes it is great over ice cream or used to sweeten drinks and cocktails. Add water, lemon zest and lavender to small pot and place over medium heat; allow to simmer for five minutes then add the sugar and still until dissolved. Allow the mixture to cool to room temperature and then strain through a sieve. Serve chilled and dilute to taste (about one part lemonade to two parts water). There are a number of cocktails that work well with lavender, vodka, martini and gin seem to be the alcohol base among the most common. I decided to seek expert advice and so I asked fellow Galwegian and Sunday Times Food Columist Mona Wise (@WiseMona) for her suggestion. 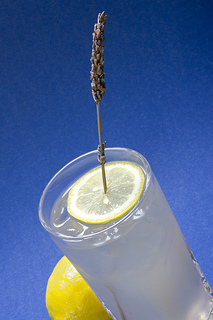 Mona recommended adapting a French 75, substituting the sugar or syrup for lavender syrup. As this cocktail is made with Gin and Prosecco I did not need any persuading to try it out. Combine the gin, lavender syrup and lemon juice in a cocktail shaker filled with ice, shake well and then strain. Add to glass and then top up with prosecco. Garnish with a sprig of lavender. I am really looking forward to experimenting with this recipe again this weekend, I have a group of close friends coming over tomorrow night and I think this will make an impressive aperitif! For those looking for a non-alcoholic lavender drink I can highly recommend lavender tea. I usually use one teaspoon of dried lavender to one cup of boiled water and allow to sit for five minutes. I can vouch for its effect for inducing a really good nights sleep. I have never grown lavender from seed before but I think that will change now – I am keen to try out all the seeds in the collection. It is on my “Lavender List” for this year. I also want to make lavender soap and some other lavender cosmetics, as well as try my hand at making lavender wands and lavender icecream but I think that will be a blog for another day! I do not use any chemicals on, or near my Lavender; the suggested uses and recipes given within this blog are recommended for chemical-free lavender, it is a good idea to either use your own home grown lavender that you know if “free-from” or buy from an organic and/or reputable source. I was going to include the attractiveness of lavender to certain insects, particularly bees. I think that would make a whole blog within itself so I have left that for another day. However, as pointed out to me by @unusual_plants, we need to be very aware of any products we use with our home grown lavender, in the interest of our little buzzing buddies. This includes checking the content of the compost you may choose to plant your lavender in as they may still contain such bee threatening compounds as neonicotinoids! If you enjoyed this blog, tried some of the suggestions or have any questions please leave me a message in the comments below!